In this class we will first learn some great tips and tricks on sewing curves. Then we will explore using color to make each block shine in a different way. Once the blocks are sewn, we’ll explore different ways to put the finished blocks together to create a design that’s uniquely yours! This is a confident beginner level class. We will use all sizes of my curved templates that are available on my site bettycrockerass.com/shop. Each class participant will receive 25% off anything in the shop as well as free shipping if you would like me to deliver the order to you in class. For the discount use both BLUEBAR25 and FREESHIPPING. If you prefer not to purchase the acrylic templates, please email me at bettycrockerass@gmail.com and I will send you a PDF so that you can transfer them to template plastic. Make sure you like your fabrics and they go well together. You can make each block in the same colorway or mix it up and make them all different. NOTE: These blocks finish at different sizes. If you’d like to do a “sampler” and make sure they all fit together, please email ahead of time and we will work it at together! In a previous life Jen Carlton Bailly probably sold you a pair of jeans or khakis at The Gap. Today you'll find her covered in thread and searching down the latest inspiration for a quilt. 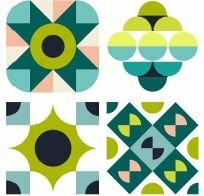 A self proclaimed master at curves, she finds pleasure in creating quilts with secondary patterns that make you stop and wonder. Originally from Utah, Jen found her way to Portland, Oregon via Utah, Colorado, New Mexico, and Seattle. While Portland is amazing, she misses the dry desert and the Rocky Mountains. Jen has a love for: cats, cats on quilts, cats wearing costumes, baking, sewing, gin rummy, fabric, Vespas, and the Oxford Comma. Jen has no love for: Radio Head (she knows, she knows), socks, wool (she's allergic), Candyland, and being called Jenny.